I am not a big candy consumer, but I do know what constitutes a pleasant candy experience and what does not. This may seem to be a trivial topic but I feel it is one we can all relate to to some degree. Just sit back and relax as I review some of the most cherished and infamous confections of our time. Lets start with the Chick-O-Sticks. I haven't seen this one around for 20 years, but it is kind of like a butterfinger without the chocolate, but way messier. I like the taste, but it is a crumb explosion waiting to happen. Next would be Red Hots. I would also put all hot candy in this category. Anything that burns your mouth and causes you to panic while you are eating it should not be considered candy. Black Licorice would be next in all of it's evil forms. I think Good and Plenty are black licorice coated in liquid paper. Black licorice is a favorite for people with completely screwed up taste buds. When I think of black licorice one work comes to mind: Bile. Jaw Breakers are the next ridiculous candy, especially the big ones you have to hold with both hands and lick like a cow. Anything that takes you days to eat can not be that good. Reece's Peanut Butter Cups are a favorite for many people, but these always burn my throat and give me heartburn. They are just too rich and oily. They are like a brownie mix in a candy wrapper. It also reminds me of slurping oysters when I see people slide them into their mouths off the paper cup. 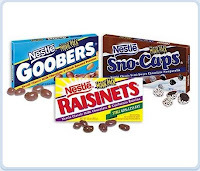 Raisinets, Goobers, or Snowcaps have to be some of the worst ever. They are all brought to you by the same company that only knows how to make gross candy. Laffy Taffy is nothing more than sugar coated in petroleum lubricant wrapped in lame jokes. I have never been a fan of Jelly Beans especially at Easter. I can't stand the texture of chewing course sugar as it dissolves in your mouth. Cotton Candy is a freak's treat. I associate this abomination with cob webs and old lady's hair (unless you are an old lady with pink or blue hair, then I only associate it with cobwebs). I try to avoid anything prepared by a Carnie. Hersheys special dark chocolate is always the last choice of the 4 different fun sized flavors. Just eat a teaspoon of baking cocoa instead because it tastes the same. Charleston Chew doesn't taste bad, but when you bite it and it stretches, the outer chocolate shell disintegrates into small pieces that falls into your lap while you are driving. By the time you get to your location the small chocolate pieces you are now sitting on have melted and are stuck to your pants. I will never fall for that prank candy again, but at least I'm not holding a grudge. My final least favorite treat is Turkish Delight. Luckily it is only popular in strange lands like Turkey, Canada, or Narnia. To end on a positive note I would like to mention some good candy. If a candy could be a super hero these would be the Superfriends. Sweet's milk chocolate covered orange sticks, Toblerones, Kit Kats, Twix, Almond Joy, Symphony Bars, Gummi Bears, Twizzlers, Junior Mints, and Hersheys Kisses with almonds. The joy these bring the world counterbalances the evil from the previously mentioned Legion of Doom candies. I also accept any of these good choices in lieu of your membership fees for reading my blog. During the 1997 All Star Weekend, the NBA came out with their list of the greatest 50 players of All Time. I agreed with most of the recipients, but I feel that some players got ripped off (Dominique Wilkins, Maurice Cheeks, Gary Payton). Ever since then I have thought about what criteria should be used to determine the greatest players. Is it winning championships, being an All-Star, holding league records or just having a long and successful career? I've been working on this for years and I came up with a formula to help determine who the greatest players are. I used a point system and gave players varying points for each of the following categories: 1) each year they played in the NBA, 2) every year they were selected as an All-Star, 3) each championship they earned, 4) each MVP, and 5) for being in the top all time leaders for Points, Rebounds, Blocks, Assists, and Steals. As suspected many of the old timers no longer qualify for the top 50 since it has been 10 years and younger players have climbed the ranks and taken their place during this time. I don't mean to disrespect any of the legends who had previously been voted in, but some of them simply did not belong to begin with. Billy Cunningham and David Bing? Come on! As much as I like Pistol Pete, he just didn't have the numbers to justify the honor either. I thought Shaq was awarded the honor prematurely. He has obviously earned it now, but it would be like saying Lebron James is one of the 50 greatest players before he proves anything. After compiling my spreadsheet results I still did not agree with some of the rankings because there are just some intangibles that are hard to quantify. Kareem actually came out with the highest total of all players according to the formula. For anyone interested in seeing the exact number totals and ranks of the top 75 players of all time, I would be glad to share it with you, but in the mean time I have listed my version of the 50 greatest players. The players in bold are new to the top 50 from the original list.